This is another girl that shows what a tremendous impact a wonderful buck like Chase has had on our herd. 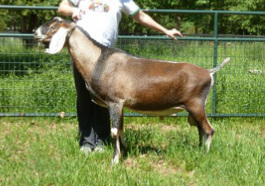 She was one of our first SGCH does, and our first LA91 nubian! ​Oprah achieved her MILK STAR in her first lactation for butterfat & protein. She excels in General Appearance and in Dairy Character. Her udder is more capacious than her mother's, but still with the tight "socked on" attachments that her dam Rosemary has, on a longer and more elegant body ! We are so pleased that her offspring have performed as well as she has. Both are now finished champions. Her buck from an AI with Lakeshore Hitthejackpot (Chance) is here and producing lovely daughters like Echo. Her daughter Cir-El (Ellie) from a breeding with Kastdemur's Kal-El finished her CH in 2016 while in extended lactation !! 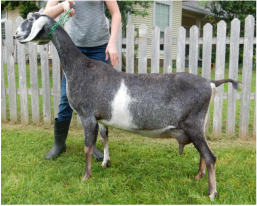 Oprah is a POWERFUL and ELEGANT doe, appraised @ 91 as a 5 year old AND now is also a permanent CHAMPION by going BEST DOE IN SHOW ...not once...but TWICE! She is our second SGCH (Thelma was first just a month earlier), and she is our SECOND Rosemary daughter to achieve this recognition !!! Oprah is now "retired" and hopefully can just hang out and age gracefully, as she deserves.